The Business Continuity Management System (BCMS) standard ISO 22301: 2012 was released by ISO in 2012. The ISO 22301 certification requires proper training for system awareness that guides you for better understanding of BCMS as per ISO 22301. 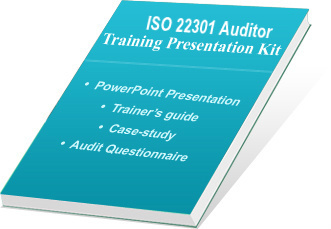 We are providing ready-to-use ISO 22301 awareness and auditor training presentation kit. Many organizations and individuals have taken part in our business continuity management system training programs, which we have delivered using this BCMS Presentation Kit. The ISO 22301 auditor training presentation kit offers relevant information about BCMS requirements and documentation process as well as steps for certification. Our team of highly-qualified and experienced consultants provide certification consultancy for establishing and implementing BCMS as per ISO 22301: 2012.
Business Continuity Management System - ISO 22301:2012 Auditor Training Presentation Kit is prepared by our team of highly-qualified business management professionals. The kit includes BCMS awareness training presentation slides, which are very useful while conducting corporate training within the organization or any work area. We have used this presentation kit for awareness training programs on ISO 22301:2012 for our clients and helped them in successfully implementing business continuity management system within their organizations. Overview of Business Continuity Management System. This part includes write-up in MS-Word for ready-reference to the trainers and participants and for their understanding and reading. Samples of audit checklist templates and ISO 22301-2012 awareness training certificate are also given. Hand-outs written in MS Word document 2007 and Presentation is made in Powerpoint. Developed under the guidance of experienced BCMS trainers and consultants. The ISO 22301 auditor training kit is verified and evaluated at various levels by our team and more than 1000 hours are spent in preparation of this training presentation kit. View free Demo of Training Presentation Kit and purchase it with secure online transaction via paypal.com.